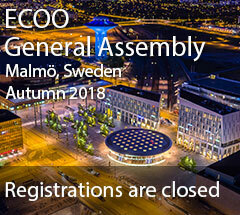 The Swedish Optometric Association is pleased to invite ECOO members to the autumn meeting 2018 in Malmö, Sweden on 19-21 October 2018. We placed the focus on a cost-effective meeting. We therefore chose Malmö as the location and the congress venue is Malmö Exhibition & Congress Centre. The welcome reception on Friday and the Saturday dinner will take place at the conference venue. No time-consuming transportations needed. The venue is in the most southern part of Sweden close to the stunning Öresund bridge, connecting Sweden and Denmark. The congress venue is five minutes’ walk from the train station from where you reach the Copenhagen International Airport in 11 minutes and Malmö Central station in 7 minutes. Book your flight to Copenhagen in Denmark, Kastrup Airport (CPH). Direct flights will be available from all major European cities. Take the train bound for Sweden directly from the airport. The train station at Kastrup airport is one level down in the building Terminal 3. The trains leave for Sweden every twenty minutes, and will cost one way 110 SEK (ca 10,50€). The first stop in Sweden is Hyllie station, which is close to our meeting venue. This is also where the Checkpoint for Border-Custom and Passport-control is. We recommend the Malmö Arena Hotel, Hyllie stationsväg 2, Malmö. The hotel is located 400 meters from train station for a five-minute slow walk. We have negotiated special rates for ECOO delegates to be payed direct to the hotel. Rates are accessible from now on to latest Friday 17th August. After that we must lock up our group reservation, and the rooms will be released for anyone. So, notice this; you must book your hotel room no later than 17th August to be sure to get a room. The deadline to register to the ECOO General Assembly (not hotel) is Friday 14 September 2018. Payment of the conference fee to the SYNBAR AB must be done at the latest on the same day. You will receive a confirmation with the details of your registration when the payment has been confirmed at the indicated email address in the registration form. Cancellations received latest August 17th 2018, will have a penalty of 10% of the registration fee. Cancellations received between August 18th and September 14th 2018, will have a penalty of 50% of the registration fee. Cancellations received from September 15th 2018, will not be refunded. Participants substitutions are allowed. Substitutions and cancellations must be notified well in advance to the Congress Organizer, via e-mail. The ECOO meetings will take place within easy reach to the centre of Malmö. We therefore decided not to arrange an accompanying person programme. Across the street from the hotel you find Emporia, the newest big shopping mall with good rates, the exchange rate to the € is currently at your advantage. From Hyllie train station you have 7 min. travel to the city centre of Malmö. You can easily use the train or bus when in Malmö and this is also the most cost-efficient transportation. For more information about Malmö for tourists visit the Malmö Convention Bureau. Read the presentation given at the last General Assembly about the Malmö meeting.